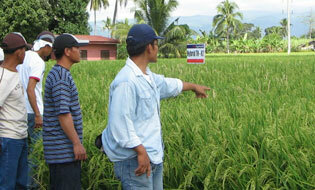 A “Rice Derby” among palay seed varieties was conducted in Cotabato, Mindanao and the winner is Seedworks Philippines. The yield was certified by the Department of Agriculture Regional Field Office 12. TH-82 hybrid rice variety posted a yield of 8.05 metric tons per hectare. This is double the average production in the Philippines by other hybrid rice varieties. The hybrid rice developed by SeedWorks Philippines Inc. posted the highest yield among other hybrid palay seed varieties during a rice derby held in Cotabato, Mindanao. Seedworks’ TH-82 hybrid rice yielded a total of 8.05 metric tons per hectare, double the reported average production. The rice derby was held in Region 12 where farm owners and rice growers allowed their farms to be used. This was done in support of the rice hybridization program of the government. TH-82 posted a yield of 8.05 MT as compared to other varieties developed that gave a yield from 4 – 6 metric tons. Another hybrid rice variety developed by Seedworks performed exceptionally well, the variety called US-88 yielded 6.03 MT per hectare. It has long grains and excellent eating qualities. It was participated in by farmers, seed producers and government officials. The event that spanned 3 days were supported by the the Rice Productivity Advocacy, Inc. (Rice Board), the SOCCSKSARGEN (South Cotabato, Cotabato, Sultan Kudarat, Sarangani, General Santos) region, the DA National Rice Program, the provincial government of Cotabato and the municipal government of M’lang. The winner, Seedworks is engaged in breeding, marketing and production of hybrid rice, corn and vegetable seeds. The programs of Seedworks are based in India, Thailand and the Philippines. SeedWorks is a company that breeds, produces and markets hybrid rice, corn and vegetable seeds. The company invests a significant amount of its annual revenues on research and development to provide a continuous stream of exceptional products. Its research and breeding programs are based in India, Thailand and the Philippines.